Is the Scientific Method a Part of Science? You probably all remember it, and I can almost guarantee that you were all taught it if you went through any sort of standard American education system (with full recognition for my non-USAian readers). It’s called the Scientific Method. The question is, does anyone outside of Middle and High School science class actually use it? I was asked by a member of the public, after I had finished judging, why that was. He wanted to know why the high school students seemed to have forsaken the entire process and methodology of science, not having those steps clearly laid out. My answer at the time – very spur-of-the-moment because he was stuttering and I had to catch a bus – was that it IS there in the high school work, but it was more implicit than explicit. That often in research, we have an idea of something and then go about gathering data for it and see what happens: It’s more of an exploration into what the data may show rather than setting out on some narrow path. That was about a month ago, and I haven’t thought much more about it. But, the Wired article today made me think this would be a good topic for a blog post where I could wax philosophical a bit and see where my own thoughts lay. Look at just about any astronomy “experiment”. Most of the cool things in astronomy are also discovered and then a model is created. So, the question comes second. How do you do a traditional experiment on star formation? I guess you could start with some hydrogen and let it go – right? Well, that might take a while. That said, I’m sure that other fields have the same issues, and it’s really just a big grey area. What I’m going to talk about, that is. Some fields may be more towards one end of the greyscale than the other. I recently was a co-author on a paper entitled, “ Distribution of Early, Middle, and Late Noachian cratered surfaces in the Martian highlands: Implications for resurfacing events and processes.” The paper was probably the only professional paper I have ever been an author on that explicitly laid out Hypotheses, tests for those hypotheses, what the conclusion would be depending on the results, then the Data, then the Conclusions. And it was a really good way to write THAT paper. But not necessarily other papers. I had a paper that was recently accepted (too recently to supply a link). The paper was about estimating and modeling the ages of the largest craters on Mars. There was an Introduction, Methods, Data, and Conclusions. There was no Hypothesis. It was effectively a, “Here is something we can explore with this database, let’s do it and put these numbers out there and then OTHER people may be able to do something with those numbers (or we can) in future work.” There really was no hypothesis to investigate. Trying to make one up to suit the Scientific Method would have been contrived. … often the results of a scientific study are often presented in the format of the scientific method (even though it might not have been carried out in that way). This makes it seem like just about all research in science follows the scientific method. This is especially the case in medical journals, but not necessarily elsewhere. 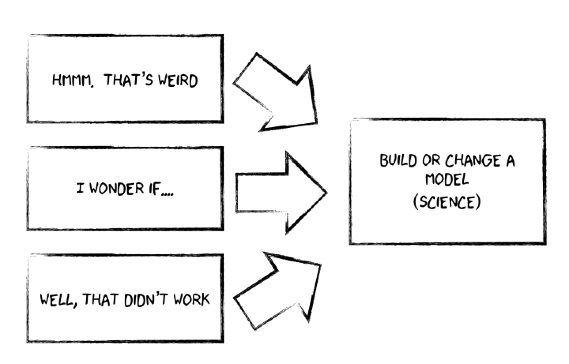 There are a lot of key elements, but I think I could boil it down to this: make models of stuff. Really, that is what we do in science. We try to make equations or conceptual ideas or computer programs that can agree with real life and predict future events in real life. That is science. I will preface this next part by saying I am NOT up-to-date on the latest pedagogy of teaching and I am NOT trained in teaching methods (other than 50+ hours of Graduate Teacher Program certification during grad school plus teaching several classes, including two as instructor of record). That in mind, I think that this is a good idea in later years of grade school education. In the early years, I think that the methodology of the Scientific Method helps get across the basic idea and concepts of how science works, while later on you can get to how it practically works. Let me explain with an example: In third grade, I was taught about the planets in the solar system plus the sun, plus there are asteroids, plus there are random comets. In eighth grade, I was taught a bit more astronomy and the solar system was a bit messier, but still we had those nine planets (this was pre-2006) and the sun and comets and asteroids plus moons and rings. Then you get into undergrad and grad school, and you learn about streaming particles coming from the sun, that we can be thought of as being in the sun’s outer-most atmosphere. You get taught about magnetic fields and plasmas. Zodiacal light. The Kuiper Belt, Oort Cloud, asteroid resonances, water is everywhere and not just on Earth, and all sorts of other complications that get into how things really work. To me, that’s how I think the scientific method should be taught. You start with the rigid formality early on, and I think that’s important because at that level you are really duplicating things that are already well known (e.g. Hypothesis: A ping pong ball will fall at the same rate as a bowling ball) and you can follow that straight-forward methodology of designing an experiment, collecting data, and confirming or rejecting the hypothesis. Let’s put it bluntly: You don’t do cutting-edge science in middle school. In high school — in a high school with good science education — you actually do start to learn more about the details of different ideas and concepts and solid answers are no longer necessarily known. You want to find out, so you might design an experiment after seeing something weird, and then gather data to try to figure out what’s going on. That’s how science usually works in the real world, and I think it’s a natural progression from the basic process, and I still think that basic process is implicit, if not explicit, in how science is usually done. I just got back from a major science conference two weeks ago, and I sat through several dozen talks and viewed several hundred poster presentations. I honestly can’t remember a single one that was designed like a middle school science fair with those key steps from the Scientific Method. That said, this has been a ~1400-word essay on what I think about this subject. I don’t expect much to change in the near future, especially since – as the Wired article points out – this is firmly entrenched in the textbooks and in Middle School Science Fair How-To guides. But, I’m curious as to what you think. 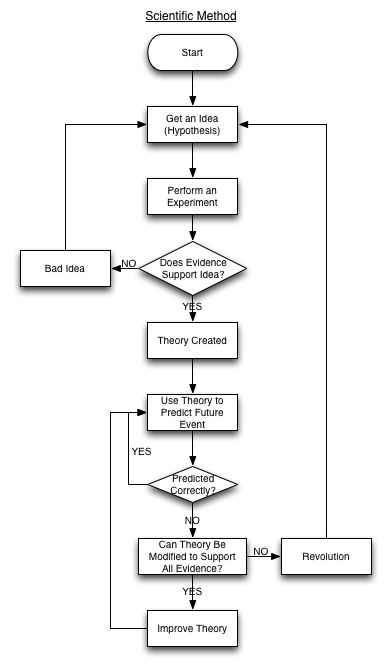 Do you think the Scientific Method is useful, useless, or somewhere in-between? Do you think it should be taught and/or used in schools? Do you think it should be used in science fairs? Do you think professional scientists should use it more explicitly more often? A few weeks ago, I learned that the popular Monster Talk podcast would be interviewing Skeptiko podcast host, Alex Tsakiris. They ended up later posting it instead on their Skepticality podcast feed, and the interview also was episode 153 of Skeptiko; it came out about two weeks ago. The interviewers from Monster Talk are Blake Smith, Ben Radford, and Karen Stollznow (the last of whom I have the pleasure of knowing). Got all that? If the name Alex Tsakiris sounds familiar but you can’t quite place it and you’re a reader of this blog, you probably recognize it from the two previous posts I’ve written about him on this blog. The first was on the purpose of peer-review in science because Alex (among others) were talking about how peer-review was a flawed process and also that you should release results early without having a study completed. Fourteen months later, I wrote another post on Alex, this one being rather lengthy: “Skeptiko Host Alex Tsakiris: On the Non-Scientifically Trained Trying to Do/Understand Science.” The post garnered a lot of comments (and I’ll point out that Alex posted in the comments and then never followed-up with me when he said he would … something he accuses skeptics of not doing), and I think it’s one of my best posts, or at least in the top 10% of the ~200 I’ve written so far. This post should be shorter than that 2554-word one*, despite me being already in the fourth paragraph and still in the Introduction. This post is further commenting on not the actual substance of Alex Tsakiris’ claims, but rather on the style and format and what those reveal about fundamental differences between real scientists and pseudoscientists. I’m going to number the sections with the points I want to make. Note that all timestamps below refer to the Skeptiko version. *After writing it, it’s come out to 3437 words. So much for the idea it’d be shorter. Alex raises an interesting point that, at first glance, seems to make perfect sense. Why belittle and debunk the crazies out there when you could spend your valuable time instead investigating the real phenomenon going on? The problem with this statement – and with psi in general – is that it is not an established phenomenon that actually happens. Psi is still in the phase where it has yet to be conclusively shown to exist under strictly controlled situations, and it has yet to be shown to be reliable in its predictions/tenants. By this, I mean that psi has yet to be shown to be repeatable by many independent labs and shown to be statistically robust in its findings. I would note the obvious that if it had been shown to be any of these, then it would no longer be psi/alternative, it would be mainstream. Hence, what the vast majority of skeptics are doing is going out and looking at the very basic question of does the phenomenon exist in the first place? If it were shown to exist, then we should spend our time studying it. Until then, no, we should not waste time trying to figure out how it happens. This really applies to pretty much everything, including UFO cases. In that situation, one has to establish the validity by exploring the claims before one looks at the implications, just like with alleged psychics. A really simple if contrived example is the following: Say I want to study life on Io, a moon of Jupiter. I propose a $750 million mission that will study the life there with cameras, voice recording, chemical sensors, the works. I would propose to hire linguists to try to figure out what the beings on Io are saying to the probe, and I’d propose to hire biologists to study how they could survive on such a volcanic world. NASA rejects my proposal. Why? Because no one’s shown that life actually exists there yet, so why should they spend the time and money to study something they don’t know is actually there? And, not only that, but Io is so close to Jupiter that it’s bathed in a huge amount of radiation, and it is so volcanically active that it completely resurfaces itself every 50 years, making even the likelihood of life existing there very slim. It’s really simply basically practically and all other -ly things untrue. Alex does not understand quantum mechanics. Almost no lay person understands quantum mechanics. The vast majority of scientists don’t understand quantum mechanics. Most physicists don’t understand quantum mechanics, but at least they know to what things quantum mechanics applies. Alex (or anyone) making a broad, sweeping claim such as he did is revealing more their ignorance of science than anything else. Unless I’m mistaken and he has a degree in physics and would like to show me the math that shows how quantum mechanics proves materialism is wrong. Alex, if you read this, I’d be more than happy to look at your math. You will need to show where quantum mechanics shows that consciousness – human thoughts – affect mater at the macroscopic level. Or, if you would like to redefine your terms of “consciousness” and “materialism,” then I will reevaluate this statement. A habit of Alex is to relate the results of individual researchers who found the same psi phenomenon many different times in many different locations (as he does just after talking about quantum mechanics, or about 45 minutes into the episode where they all discuss this, or throughout the psychic detective stuff such as at 1:30:30 into the episode). Since I’ve talked about it at length before, I won’t here. Succinctly, this is an argument from authority, plain and simple. What an individual finds is meaningless as far as general scientific acceptance goes. Independent people must be able to replicate the results for it to be established as a phenomenon. The half dozen people that Alex constantly points to does not trump the hundreds of people who have found null results and the vast amount of theory that says it can’t happen (for more on that, see Point 6). For more on this, I recommend reading my post on “Logical Fallacies: Argument from Authority versus the Scientific Consensus” where I think I talk about this issue quite eloquently. It’s also relevant here to point out that a researcher may have completely 100% valid and real data, but that two different people could reach very different conclusions. Effectively, the point here, which is quite subtle, is that conclusions are not data. This comes up quite dramatically in this episode about 22.3 minutes in when discussing the “dogs that know” experiment; in fact, my very point is emphasized by Ben Radford at 24 min 05 sec into the episode. For more on this sub-point, I recommend reading my post from last year‘s Point 1. The discussion here starts about 36 minutes into the episode, stops, and resumes briefly about 50 minutes in, and then they go fully into it at 1 hour 13 minutes in*. For background, there is a long history of Alex looking into alleged psychic detectives, and at one point he was interviewing Ben Radford and they agreed to jointly investigate Alex’s best case of this kind of work and then to hash out their findings on his show. This goes back to 2008 (episode 50), but it really came to a head with episode 69 in mid-2009 where they discussed their findings. For example, when Ben talked with the detectives, they had said the psychic told them the guy was “Eastern European” whereas they had separately told Alex that she had told them the guy was “Polish.” Alex counted it as a hit, Ben a miss. I count it as a “who knows?” Another specific one they talk about in this interview is “The South” versus “Florida” with the same different conclusions from each. To these points, both scientists and skeptics (and hopefully all scientists are appropriately skeptical, as well) I think can learn a lot when looking into this type of material. First, I personally think that this was a foolish endeavor from the get-go to do with an old case. Effectively every disagreement Ben and Alex had was over the specific phrasing which, unless every single thing the alleged psychic says is recorded, you are never going to know for sure what she said. Human memory simply is not that reliable. That is a known fact and has been for many years (sources 1 and 2, just to name a couple). Ergo, I think the only proper way to investigate this kind of phenomenon where you have disagreements between skeptics and other people is to wait for a new case and then document every single part of it. Second, one needs to determine a priori what will count as a hit or miss (“hit” being a correct prediction, “miss” being wrong). In the above example, if they had agreed early on that Nancy Weber only needed to get the region of the planet correct, then it would be a hit. If she needed to get the country (first example) or state (second example) correct, it would be a miss under what the detectives told Ben. This latter point is the one that is more relevant in scientific endeavors, as well. Usually this is accomplished through detailed statistics in objective tests, but in qualitative analyses (more relevant in things like psychiatric studies), you have to decide before you give the test what kinds of answers will be counted as what, and then you have to stick with that. It should be noted that hits vs. misses was not the actual crux of the disagreement, however. It was the level of specificity the psychic claimed (“Polish”) versus what the detectives told Ben they remembered (“Eastern European”), and then the broader picture to how well that information will help solve a case. I actually encounter the same thing when grading essays. This is one reason why teachers in science classes like multiple-choice questions more than essays (besides the time it takes to grade): It’s much more quantitative to know the answer is (A) as opposed to parsing through an essay looking for a general understanding of the question being asked. *I’ll warn you that this goes on for about a half hour and it’s somewhat difficult to listen to with all the shouting going on. If you’re scientifically/skeptically minded, listening to this is going to make you want to smack Alex. If you’re psi/alternative minded, listening to this is going to make you want to smack Ben. This is why I try not to get into the specifics of the exact case but rather point out the process and where the process is going wrong here. About 41 minutes into the episode and then for several minutes on, the conversation turned to the idea that psychics help with the grieving process. The reaction from me (and then the hosts) was pretty much, “Duh!” As Blake points out just before the 43 minute mark, “How many times did the [psychic] say, ‘Oh gee! That person’s in Hell! '” Thus, probably, not helping the grieving process. The conversation steered along the lines of the three hosts of Monster Talk trying to point out that yes, the effect of the alleged psychic talking with the grieving person is that the grieving person felt better. But was the cause (a) because the person was actually psychic, or (b) because the person was telling the grieving people what they wanted to hear that their loved one was happy and still with them and they would join them when they died? Alex obviously is of the former opinion (after pulling out yet another argument from authority that I talked about in Point 3 above). The others are of the latter. But the point I want to pull from this is something that all scientists must take into account: If they see an effect, there could be causes other than or in addition to their own preferred explanation. That’s really what this case that they talk about boils down to. For example, we want to know how the moon formed. There are many different hypotheses out there including it formed with Earth, it was flung off Earth, it was captured, it was burped out, or a Mars-sized orbit crashed into Earth and threw off material that coalesced into the moon. I may “believe” in the first. Another person may in the last. We both see the same effect (the moon exists and has various properties), but how we got that effect probably only had one cause. Which one is more likely is the question. Alex:… And they’re wrong because that’s not how science works. Science works by continually asking hard, tough questions and then trying to resolve those the best you can. I’m really not sure where Alex gets this first sentence (the second sentence is correct, but it and the first are not mutually exclusive). It’s simply wrong. In no field is this a valid approach except possibly psi from Alex’s point of view. If you make a claim, you have to support it with evidence that will convince people. If I say I can fly, it shouldn’t be up to you to prove I can’t, it should be up to me to prove I can. It’s that simple. And Alex gets this wrong time after time. This is further evidence (see Point 2 above) that Alex has no actual concept of science and how it works. And before you accuse me of ad hominems, I’m stating this in an objective way from the data — his own statements that have not been quote-mined (go listen to the episodes yourself if you don’t believe me). Ben: So who does have the burden of proof? Alex: Everybody has the burden of proof and that’s why we have scientific peer-reviewed journals, the hurdles out there that you have to overcome to establish what’cha know and prove it in the best way you can. It gets back to a topic we kinda beat to death on Skeptiko and that’s this idea that also hear from skeptic [sic], ‘Extraordinary claims require extraordinary proof.’ Well of course that’s complete nonsense when you really break it down because scientifically the whole reason we have science is to overcome these biases and prejudices that we know we have. So you can’t start by saying ‘Well, I know what’s extraordinary in terms of a claim, and I know what would be extraordinary in terms of a proof,’ well that’s counter to the idea of science. The idea of science is it’s a level playing field, everybody has to rise above it by doing good work and by publishing good data. I know I’ve talked about this before, but not in these exact terms. What Alex is talking about – and getting wrong – without actually realizing it is how a hypothesis becomes a theory and the lengths one has to go to to overturn a theory. That’s what this nugget boils down to. If you’re not familiar with the basic terminology of what a scientist means by a fact, hypothesis, theory, and law, I recommend reading one of my most popular posts that goes into this. The issue at hand is that it is effectively established theory that, say, people cannot psychically communicate with each other (yes, I know science can’t prove a negative and there’s no Theory of Anti-Psi, but go with me on this; it’s why I said “effectively”). Even if it’s not an exact theory, there are others that are supported by all the evidence that show this isn’t possible nor plausible. Ergo, to overturn all those theories that together indicate psi can’t happen, you have to have enough convincing and unambiguous data to (a) establish your phenomenon and (b) explain ALL the other data that had backed up the previous theories and been interpreted to show psi is not real. This is summarized as, “Extraordinary claims require extraordinary evidence.” That’s the phrase, not “proof,” which in itself shows yet again that Alex misses some fundamental tenants of science: You can never prove anything 100% in science, you can only continue to gather evidence to support it. “Proof” does not exist, just like “truth,” as far as science is concerned. Well, this post ended up longer than I had initially planned, and it took several hours not the least of which is because I listened to the episode twice and it’s almost two hours long. I hope that through this I’ve been able to illustrate several points that you and everyone needs to watch out for when evaluating claims. You need to establish that a phenomenon exists before studying it. Don’t appeal to quantum mechanics unless you actually know what quantum mechanics is. A single or small group of researchers’ results are not convincing, no matter who they are. If you want to study something that supposedly happens every day, don’t choose an example that’s 30 years old. A single effect can have multiple or different causes, including one that you don’t like. The person making the claim has the burden of evidence … always. In the end, I’ll admit that this was personally hard to listen to in parts. I took issue with Alex constantly refusing to admit certain things like the detectives saying one thing to him and another to Ben and saying Ben was lying about it and that he should say (what he didn’t say) to the detectives’ faces. That was just hard to listen to. Or Alex’s refusal to directly answer some questions in ways that would have made a politician proud. Another point that was hard to listen to but oh so sweet in the end was Alex claiming that Karen had invited him on but Karen said that Alex had invited himself on. Alex insisted that wasn’t true and said Karen was wrong and he had the transcript … and then a few seconds later the transcript was read and Alex clearly had invited himself onto their show. But, those are my personal and more emotional observations after listening to this. Do those change what we can learn about the scientific process and where pseudoscientists go wrong? No. Alex Tsakiris continues to unwittingly provide excellent examples of how not to do science. This is a short follow-up to my last post, “Mistakes in Science Apparently Means Creationism Is True.” In that fine piece of blogging, I talked some about how science is a process where we continually revise our knowledge based upon new observations and discoveries. Contrasted with creationism. The article in question was written by John Timmer, a faculty at Cornell Medical College. He got his Ph.D. in Molecular and Cell Biology (like my dad!) from University of California, Berkeley (not like my dad). So I’d say he’s reasonably qualified – while avoiding an argument from authority – to write about this topic. In his article, Dr. Timmer tells the story of a small group of researchers thought they found a retrovirus associated with prostate cancer, and they later even linked it to people with chronic fatigue syndrome. I’m about as qualified to talk about medicine as any other lay person (so not much), but I can gather that this would be pretty darn important. A retroviral link means (a) a good test to see in who this may develop, and (b) a possible cure if we could get rid of that retrovirus. Their work was published in one of the two leading journals in the world, Science. Then problems developed. I don’t want to take too much away from Dr. Timmer’s article, which I highly recommend reading. But, suffice to say, other people investigated these claims and tried to verify them. Nothing less than the country’s blood supply was actually at stake if their findings bore out. Problem was that no one could replicate them. And the main researcher’s (Judy Mikovits) co-authors started to walk away. Mikovits didn’t, ended up being fired for insubordination when refusing to share cell cultures as required, and then arrested for stealing her lab notebooks and other things. So, as the title sums, a collapsing hypothesis led to a lawsuit and arrest, but also a good moment to illustrate how science works, especially in contrast with creationism. Readers of my blog will recognize that I’ve said this before, but it’s important to get across. So I’ll try to shorten it this time. The scientific process requires duplication of findings. It requires testing of claims. It requires questioning and critiquing others’ results. It requires revision. All of these requirements are how and why the process of science is incremental and self-correcting. Mikovits’ work made it into one of the most prestigious scientific journals in the world. That does not mean everyone believed it nor that it meant it was “true.” Less than five years later, the paper has been retracted and the researcher has been pretty much disgraced in the scientific community and is facing significant legal issues due to misconduct and theft. The study was shown to be wrong. The scientific process is to thank for showing that. (And now the obligatory “in contrast, creationism … .”) In contrast, creationism generally requires putting your fingers in your ears and shouting, “La-la-la, I can’t hear you!” when something contradicts their favored position. Or, they will accept the latest study whole-heartedly if it fits their paradigm, but not admit it was wrong if later retracted or shown to be wrong or misunderstood. I pointed to Earth’s magnetic field strength last time, this time I’ll choose comets and simply link to my blog (here, or here), or podcast (here). Perhaps the worst part of the story in question is that a whole new subset of medical pseudoscience has cropped up because of Mikovits’ work. Before she came along, no people suffering from these really thought there was a retrovirus cause. Now some do, and “alternative” practitioners offer to test them for the non-existent retrovirus or offer antiretroviral agents as “cures.” Even though it’s now come out that the original study was simply wrong. But, unfortunately, that doesn’t change things once the idea is out there. The reason I’m doing a post on it is that I want to talk more about the process of how science works, how it is conducted, the self-correcting nature, and how this is the opposite of creationism. Ms. Dao’s basic premise is a recent Nature report entitled, “Science Publishing: The Trouble with Retractions” (unlike most articles, this one seems free to the public to read, so go ahead and follow the link to read it). The report (the point of which the ICR article misses) really talks mostly about attitudes among journals and journal editors with regards to retractions and the reasons for retractions. It also mentioned some numbers — mainly that the number of retractions these days is around 0.02% of all papers published. And that in one week alone, around 27,000 papers are published. That means, if we multiply by about 52, over 1.4 million papers are published in scientific journals each year, and 2,800 of those will eventually be retracted. Ms. Dao seems to make a really big issue of this tiny number. She blows it way out of proportion – as I’ve shown YECs are wont to do – and somehow says that because there are a tiny number of retractions, with a small percentage of those due to fraud, this means that evolution is wrong. I’m serious. Go read her last two paragraphs if you don’t believe me. Something that Ms. Dao either does not know or willfully ignores is that scientists know this. We know that not 100% – or 99.98% – of papers published in journals are going to bear the test of time and further research. No scientist thinks that. In my undergraduate education, we would have a weekly seminar in the astronomy department where we read a paper and discussed it and decided whether or not we thought the results were valid. This is something called critical thinking where you analyze things and decide whether or not they make sense in light of all the other observable evidence. Probably the reason Ms. Dao chooses to ignore this is because YEC does not hold up to critical thinking, but more on that in the next section. In fact, far from 100% of published papers being “right,” various studies have shown that at least 30-40% of them will later be falsified based upon new data, observations, experiments, and theory. This is not a secret. It’s how science works. It is self-correcting over time because everything is subject to further testing and independent analysis. 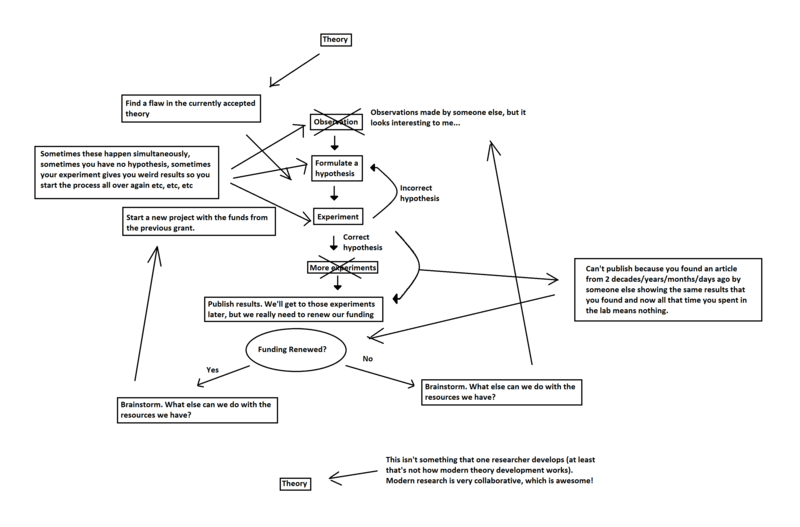 The flow chart shows the basic process that most biblical literalists use to vet new information. They may get an idea, or hear of something. Let’s use a young-Earth creationist mainstay, Earth’s magnetic field (previous blog on this, podcast on this). Data shows that Earth’s field has gone through reversals in polarity at many points in the past. The data is clearly out there for anyone to examine, and it is unambiguous that crustal rocks record a flip-flopping magnetic field. Alternatively, Russell Humphreys, of Answers in Genesis, accepts that there have been magnetic reversals, as he is able to fit it into a reading of the Bible. He explains the field reversals as rapidly taking place during the 40 24-hr days of Noah’s Flood. Hence, because they are able to fit it into the Bible, they accept it as a dogma. Ms. Dao makes much ado about almost nothing in terms of retractions in scientific literature. Something she doesn’t tell you are how many retractions there have been in the creationist literature. Obviously the Bible has never been retracted, except for those books that aren’t accepted (like the recently discovered Gospel of Judas, or the Book of Ezekial). But I’m talking things like the articles the ICR, AiG, or CMI puts out that I and many others have picked to shreds over the years. Or perhaps their own journals, like the ARJ (Answers Research Journal) or the Journal of Creation. Any retractions? The most I have ever seen is AiG’s list of “Arguments Creationists Should Avoid, which CMI copied and expanded, or when Brian Thomas of the ICR changed his article based, perhaps, on my criticisms (see the post-script in that blog post). In fact, far from a retraction, Creation Ministries International still has its article by Andrew Snelling entitled, “Solar Neutrinos – the Critical Shortfall Still Elusive” that discusses the solar neutrino “problem.” (For information on this, see my blog post on it.) The article is still in its online index for their Journal of Creation with no indication that it was retracted. The only thing you get is in the HTML version where the editor notes that the argument was valid for the time but “that the shortfall problem seems to have been solved. Therefore creationists should no longer use this as an ‘age’ argument.” If that’s what passes for a retraction, these guys should run for Congress.